Over the course of a lifetime, lines, wrinkles and creases appear on our skin, for which Botulinum Toxin A is a safe and effective treatment. Frown lines treatment can be used to soften cleavage lines and give a mild 'lift' to the bust line - a safer alternative to going under the knife. For those with sun damage in the décolleté area, anti-wrinkle injections can be used to reduce the depth and severity of chest wrinkles. The upper nasalis muscle is responsible for the animation lines on the nasal bridge. Known as 'bunny lines', these can be treated with anti-wrinkle injections. Treatment for bunny lines also complement wrinkle relaxing injections to the frown lines and crows' feet. Bianca Estelle can dramatically improve the appearance of crows' feet with frown lines treatment. These eliminate the fine lines which radiate from the corners of the eyes and can even reduce deeper lines which extend down towards the upper cheek. The youthful brow tapers upwards at a 45 degree angle, ascending into a soft peak over the eyes. Subtle anti-wrinkle injections provide a lifting effect, erasing fine lines on the forehead and smoothing out wrinkles caused by muscle contractions. Anti-wrinkle injections can help you achieve a beautiful smile. Precise, low dose anti-wrinkle injections into the upper lip can reduce excess gum show. In significant cases, lip fillers can be performed alongside anti-wrinkle injections for maximum gummy smile correction. As we age, the soft tissues descend around the jaw, leading to a loss of definition in the lower face. The neck may also even exhibit 'banding'. 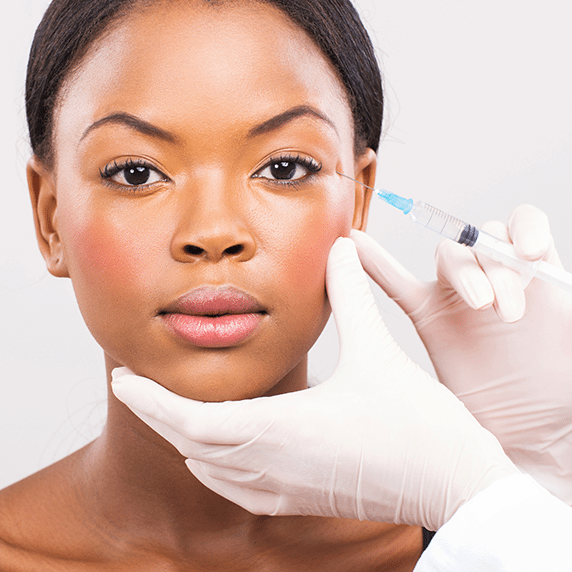 Anti-wrinkle injections can be used to tighten up the jawline and soften neck bands. Travelling down from the mouth corners to the bottom of the chin, marionette lines appear to pull the corners of the mouth down into a frown. Anti-wrinkle injections into the DAO muscles can significantly improve their appearance, quite literally turning your frown upside down. Hooded lids, sometimes a result of loose skin or low brows, can be present due to genetics or age. Anti-wrinkle injections can open up tired eyes. For a slimmer lower face, anti-wrinkle injections can be used to taper a square jawline into a beautiful v-line silhouette. Those with a 'bottom heavy' lower face can undergo Botulinum Toxin for masseter hypertrophy in order to achieve a more balanced look.